Me in Mind is an official Girlguiding UK resource, aimed at older Guides and Senior Section. Its focused on mental and emotional well being, which is a very important part of teenage life, especially for girls. Mental health comes attached with a lot of stigma, but the pack is very positive and has a variety of really good ideas on how to approach difficult subjects. There is a badge for doing the allotted number of activities, but there are so many in the pack, you could do the badge several times over and still have more to spare. Me in Mind can be purchased at the official Girlguiding UK Shop. course they’re better to select with guidance. We started with the compliment relay game, where you form teams, and each team member goes up to the team piece of paper and writes a compliment about themselves on the paper, runs back and the next one goes. We gave them a 5 minute time limit, and ran two teams of about 10, who managed about 15 per team. We followed this with a discussion about why it was tricky to compliment themselves (own worst critics etc) and picked out a few and asked the girls to share who they thought in the room deserved the compliment. To finish it off we did a compliment train, where you pay a compliment to the person beside you and they to the person the other side and so on, which the girls really enjoyed and the confidence grew. their faces. They didn’t believe it was really in the pack because it sounded far too funny a task. made it clear we were discussing in confidence, and respecting others opinions, and we heard from some of our quietest guides who had been on the receiving end of hard times with peers at school, and felt quite supported by her Guiding friends subsequently. swooning from half the unit). They draw out the gift or describe it on paper in five minutes (they wanted to take longer, so we let them) and they share what they have ‘given’ and why, and exchange the paper. We finished off with some wink murder and badge presentations and sent lots of happy faces off home. Really recommend borrowing/buying a copy to try some of the activities out, even you don’t want to tackle a whole badge. Its huge, and this is just a tiny fraction of the different topics it covers. Mental health on the Fourth Plinth (One and Other) performance art in Trafalgar Square, London. 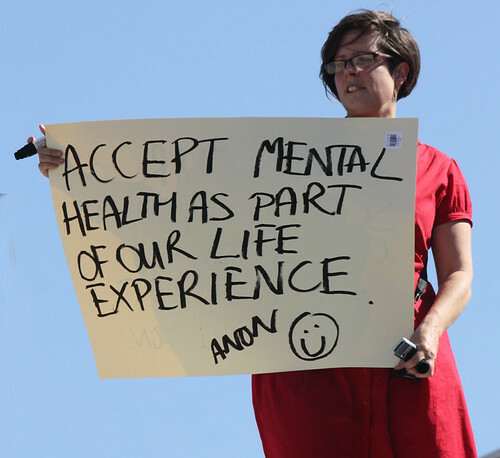 I am standing on the plinth to represent people whose voices so often go unheard, either because they don’t have the necessary support, or they are socially isolated, or they are quite simply desperately marginalized: people with mental health issues. According to the World Health Organisation, depression will be the second most costly health problem worldwide, coming second only to heart disease and ahead of cancer. Despite this, however, and despite the fact that around one in four adults will experience them at some point in their lives, mental health problems are still surrounded by ignorance, fear and prejudice. Research has shown that prejudice against people with mental health issues is actually increasing, despite social attitudes regarding sexuality, ethnicity and other similar issues improving.